Is Ryan Getzlaf Overpaid? 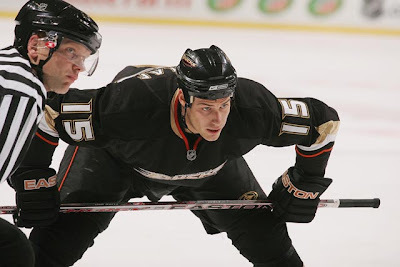 | Five Minutes For Fighting Five Minutes For Fighting: Is Ryan Getzlaf Overpaid? It's not often that an elite No. 1 centre hits the open market, and the Anaheim Ducks made sure it won't happen this year, giving Ryan Getzlaf an 8-year deal worth $8.25 million a season. Getzlaf now owns the fourth highest cap hit in the league, tied with Eric Staal and behind Alex Ovechkin, Evgeni Malkin, and Sidney Crosby. That's big money, especially for a player coming off a down season. But Getzlaf has already proved that last season was an anomaly. He's tied for fifth in points with 29, and is on pace to register the best season of his career—a career in which he's only failed to break a point-a-game three times, two of which were his first two seasons. Throughout his career, Getzlaf has been a dominant two-way centre; coaches aren't afraid to start him in the defensive zone and he's even being used to kill penalties under Bruce Boudreau. He is a puck-possession beast that plays a physical game. If there is any player worthy of huge money, it's Getzlaf. But regardless of Getzlaf's ability, $8.25 million is a huge number that elicits a strong negative reaction. However, despite its humongous size, Getzlaf's deal is fair market price for a No. 1 centre about to become an unrestricted free agent. Below is a table of No. 1 (or fringe No. 1) centres who were either unrestricted free agents or were about to become unrestricted free agents since the salary cap's implementation. Getzlaf is being paid more than the average deal given out to UFA No. 1 centres. On average, players who re-sign before hitting free agency leave a bit of money on the table, approximately 1% of the cap, which works out to about $662,000 under today's cap. Getzlaf's cap hit percent is slightly higher than the average centre that tests the market on July 1 (by about $205,000 in today's dollars) and those centres that re-sign with their team (by about $868,000). Simply based on dollars, you could conclude Getzlaf is slightly overpaid compared to what the market has rewarded since the salary cap's introduction. However, Getzlaf has been substantially more productive than other free agent centres. Getzlaf's 0.94 points per game is higher than the average for centres hitting July 1 (0.81) and those who re-up with their current team (0.88). Over a full season, that difference works out to be between 5 and 10 points. Moreover, out of the 15 other centres who have gone to or approached unrestricted free agency, Getzlaf has produced more points than all but two, Sidney Crosby and Joe Thornton. Yet his cap hit percent is only the seventh highest. Compared only to players with at least 0.90 points per game before signing their new deal, Getzlaf's deal is only slightly larger (12.83% compared to 12.16%, or about $430,000 under today's cap). The reason why Getzlaf deal is larger is not because the Ducks capitulated to his every demand. It is because the new CBA has altered free agency. Getzlaf is the first major signing affected by contract term limits. Teams can no longer tack on extra years at substantially lower salaries to deflate the cap hit. For example, Sidney Crosby's contract would have a $10.8 million cap hit if it was limited to 8 years; Vincent Lecavalier's would be $9.81 million; and Brad Richards' would be $7.38 million. So by having a maximum contract limit, the Ducks are essentially missing out on around $1-2 million in cap saving each year because they can no longer circumvent the cap. Even at $8.25 million, Getzlaf's deal is still pretty favourable compared to some other UFA deals, and not just the bonkers ones given out by the New York Rangers. Getzlaf's $8.25 million deal is actually a better value than the $6.7 million deal Pavel Datsyuk signed with the Red Wings back in 2007. Getzlaf is younger and more productive than Datsyuk was when he signed, yet Datsyuk's deal took a bigger chunk of the cap (13.32% vs. 12.83%). In addition, a player like Getzlaf has never hit free agency. All other productive centres about to become UFAs get snapped up by their current team. In terms of production, the closest player to Getzlaf that tested the market was Brad Richards, but he was five years older and already in the decline phase of his career. And with teams like Toronto desperate for a centre and with cash to spend, there is little doubt Getzlaf would have received offers of $9 million a season or more had he made it to July 1. Although Getzlaf didn't really take a home-town discount, he did leave some money on the table. The question now is whether he left enough for Corey Perry. Will Kadri Kill the Getzlaf Dream?